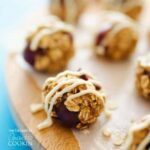 Energy Bites: bite sized cherry cheesecake healthy cookies! 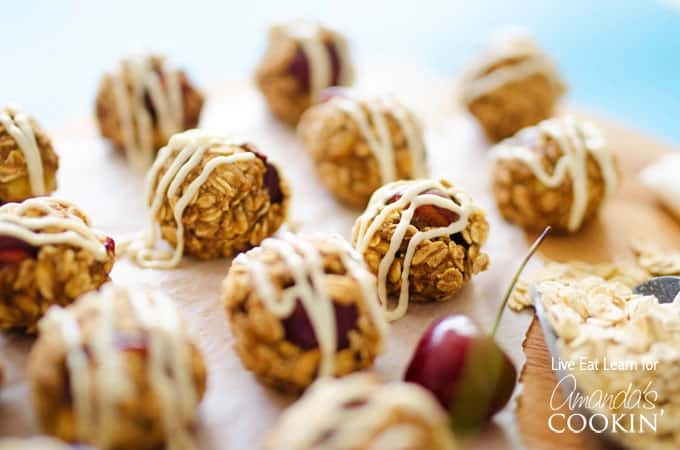 These cherry cheesecake energy bites are healthy, super delicious little oat cookies that come together in just 20 minutes! A banana oat base makes the cookies moist and chewy, while the cream cheese frosting adds the perfect amount of decadence. They are great for breakfast or as a snack! My love of cooking began with cookies. I suppose that’s probably pretty normal. I don’t think many people decide to learn how to cook starting with creme brulee or baked Alaska. No, cookies are a good starting point. 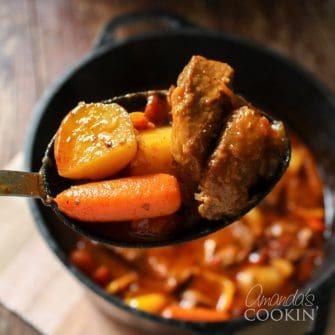 Mix a few yums together, plop them onto a pan, bake, eat them all….repeat. But now that I have a health food blog, my once a month ritual of whipping up a batch of entirely unhealthy chocolate chunk cookies has taken the back burner in lieu of healthy desserts. But when I took my first nibble of these Cherry Cheesecake Energy Bites, I realized you can have your cake and eat it too. 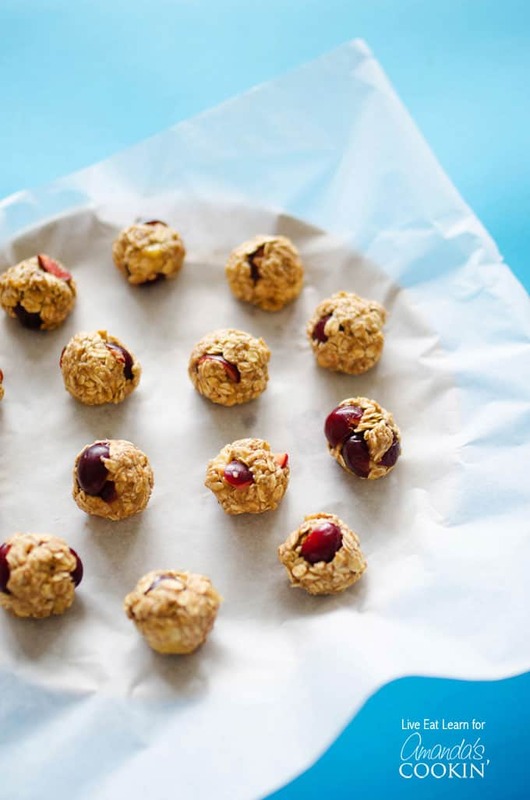 These oat bites are healthy, easy, and most importantly, they’re cookies! I based this recipe off a similar recipe I made last year, Strawberry Chia Oat Bites. But that recipe had quite a few ingredients, so I set my sights on creating a similar kind of cookie with fewer ingredients, and ones that you’d be more likely to have in your pantry. And after a bit of adjusting, I arrived at this recipe. With a squished banana and rolled oats base, the cookies are really chewy and moist. The cherries are little bursts of flavor, and a simple cream cheese frosting drizzle packs in some major decadence, without being all that unhealthy. Which means not only can I eat these energy bites for dessert, but I can have them for breakfast or pop them in a to-go container and have them for a snack. I think you’re really going to love them! If you’re one of those people that says they don’t have time for breakfast, this coffee smoothie is right up your alley. 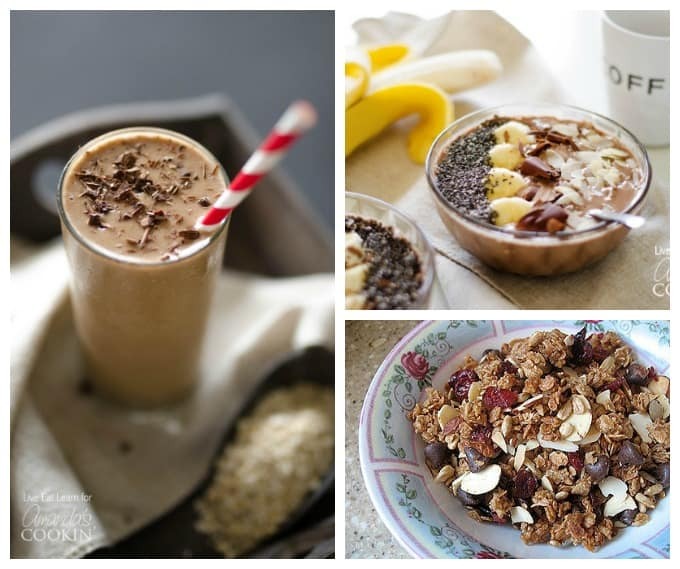 If you love smoothies but want a sit-down breakfast, try this delicious mocha smoothie bowl tomorrow! Maybe you’d like to try your hand at homemade granola. It’s easy to make and delicious as a snack or breakfast! 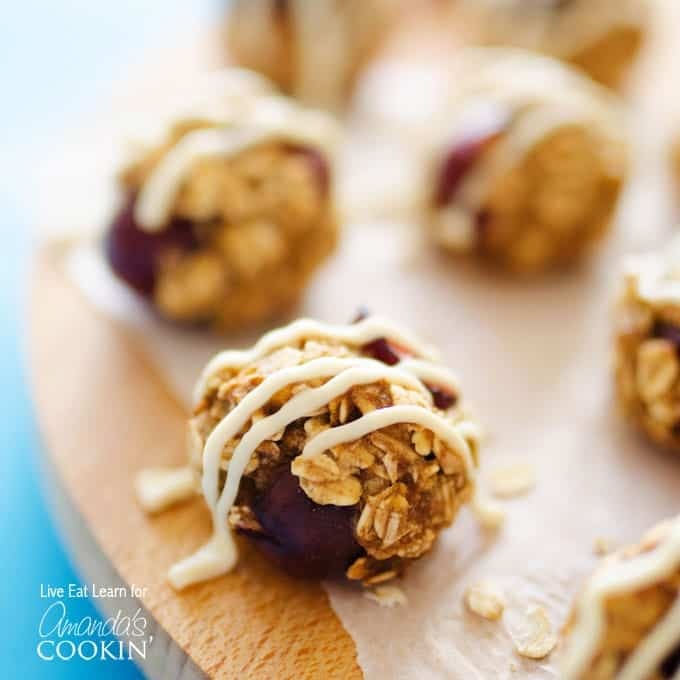 These cherry cheesecake energy bites and little oat cookies that are good for you! Great for snacking or taking with you on a hike or to soccer practice. In a large bowl, mash bananas with a fork. 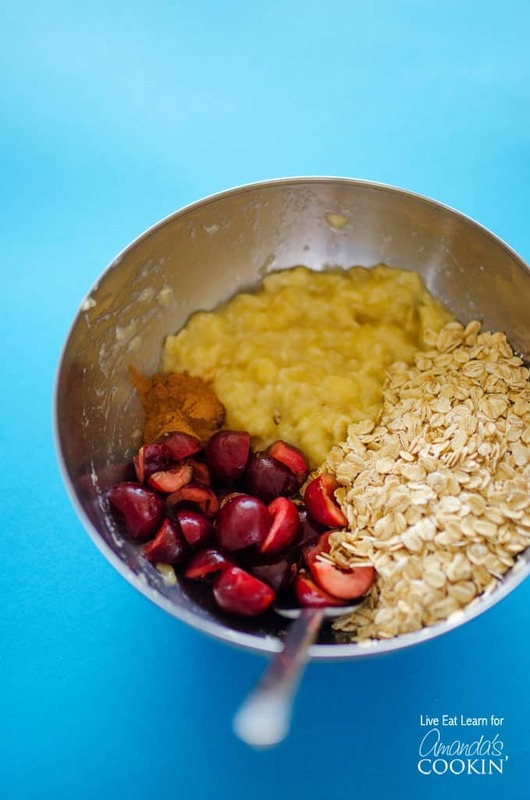 Stir in cherries, oats, and cinnamon. Roll tablespoon-sized rounds of dough into balls and place on a parchment paper lined baking sheet (you can put these pretty close together, they won’t rise or expand). Bake at 350 degrees F for about 15 minutes, until golden brown. While cookies bake, prepare icing by combining cream cheese, maple syrup, and vanilla. Whisk with a fork until smooth. Allow cookies to cool slightly, then drizzle on the icing (either with a fork or by spooning icing into a baggy, cutting off the corner of the bag, and piping the frosting over the cookies). Store in an airtight container in the fridge. These cherry cheesecake energy bites look delicious. I love cherry cheesecake so this would be awesome. thanks for sharing.